Throughout the pioneer era the dominant mode of transportation in Surrey was not road but water. In the 1870s and later the Nicomekl, Serpentine, Fraser, and to a limited extent the Little Campbell River, doubled as roads. Only a few pre*211;settlement trails existed and these were so poorly maintained that they were suitable only for a man on foot. The roads that were constructed during the 1870s and 1880s had only a limited value. They were suitable for travel during the summer months, but during the wet winter season they were virtually impassible. Only the rivers provided a year round transportation link suited to the movement of bulky commodities produced for export by the local settlers. Logs, hay and light grains would be moved over roads or trails to the river banks. There they would be loaded for shipment to such centers as New Westminster, Victoria, Semiahmoo and Bellingham. Water transport remained the dominant means of shipment until an improved rail network provided a better means for exporting the bulk commodities. The Nicomekl River was the only truly navigable stream. It had been used for generations by the Coast Salish in their seasonal movement to the Fraser fisheries near present Fort Langley. The navigable waterway had been shown to James McMillan in 1824, and his was the first European party to traverse it. The Nicomekl was wider, deeper and had a greater flow than either the Serpentine or the Little Campbell Rivers. Its only draw back was a big meander about four miles upstream. However, in 1888 local farmers dug a canal through the neck of the big bend to improve navigation. The Nicomekl was navigable as far as Halls Prairie Road with a small draught boat. 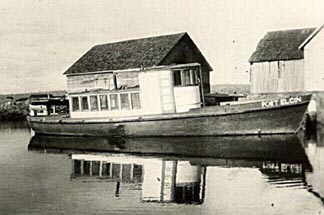 To aid navigation on the Fraser River, the Dominion Government put into service in 1884 a snag boat, the Samson, operated by Captain Angus Grant. In 1884, the year it was commissioned the snag boat, the Samson, cleared debris and stumps from the Nicomekl River and made it navigable upstream to the Halls Prairie Road Bridge. It also assisted farmers in building local docks adjacent to their barns to facilitate bulk shipments. The snag boat, first recommended by MM English in 1878, to aid the fish nets, received immediate praise for its work. It would prove invaluable in clearing the Fraser River of trees hazardous to navigation, which were continually floating downstream and becoming stuck on the sand bars. Capt Grant was acclaimed for finding a new channel for navigation down by the Sandheads, at the entrance to Fraser River. By the end of September the Samson had also succeeded in clearing the way ten miles up the Nicomekl River, close to Hall's Prairie Road (184 St). Farmers from Mud Bay to Clover Valley constructed riverbank wharfs and could ship their produce to markets in Victoria and New Westminster. The Serpentine River was also navigable to steamboats almost to Surrey Center. At Hall's Prairie, farmers depended on the Campbell River for access to saltwater. In September they protested that their way was cut off by a log boom belonging to the Dominion Sawmill Company camp, which now occupied the lands at the mouth of the river where once stood Camp Semiahmoo of the Boundary Commission. Twenty–two men were employed at the logging camp. Larger freight boats or tugs averaging fifty tons, but up to one hundred tons, usually only ventured upstream as far as the big bend in the Nicomekl to the float at the Carncross farm. If these larger boats went further upstream they would turn around on the Nicomekl near the big bend (where the river widens in the vicinity of the present Johnston and Mud Bay roads) and go backwards the rest of their run to the terminus at Halls Prairie Road. The bridges crossing the Nicomekl were lift spans with up to thirty feet of clearance. The freighter Stella was owned by Royal City Mills. It was operated by Mr. Carncross on the Nicomekl prior to roads being built in 1886. The Carncross farm is in the background. The Stella could operate as far inland as the Halls Prairie Road bridge. Most barns were located next to the rivers to provide easy access to water transportation for the bulk products. During the heyday of the Nicomekl in the late 1800s, there were reports of as many as fifteen steamships and other craft waiting for the tide to go up so they could enter the river on their business. During the harvest season, the Stewarts would be up in the middle of the night waiting for the S.S. Grainier to load up at high tide from the dock on the north side of the river, opposite the small pier near the house. They went across the river by rowboat to help with the loading of hay and grain onto the steamship before its trip across the Strait to Victoria. There it would be sold to "Scott and Pecen" a feed business active in Victoria even today. The S.S. Stella ran the trip to New Westminster with produce for the Saturday Farmers' Market. This opened early in the morning, requiring the eight hour journey by ship or wagon to be undertaken late the night before, as John Stewart often did. Various steamships towed logs from upstream on the Nicomekl to the Royal City Planing Mills in New Westminster. The trestle bridge at Elgin had it lift span to allow for such traffic until it was replaced by a concrete dam with floodgates in 1911. Crescent Road Corridor Report to Surrey by Brian Guzzi & Associates, Landscape Architects. Billy Hadden ran the "Port Elgin" in the 1920s to New Westminster as a passenger boat and to take farm supplies to the Saturday Farmer's Market. This service continued until roads were hard surfaced and land transportation became more reliable and faster. 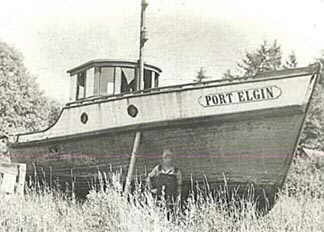 As passenger service declined the Port Elgin was converted into a tug boat to move bulk supplies or to tow log booms. Here the Port Elgin is derelict and beached behind Bill Hadden's home in Elgin. The Serpentine and Campbell Rivers were not as navigable as the Nicomekl. The Serpentine was winding, narrow, and shallow with frequent bars. Only small boats or scows could use it at high tide. The Little Campbell River was only navigable at high tide, as at low tide it resembled a small creek. 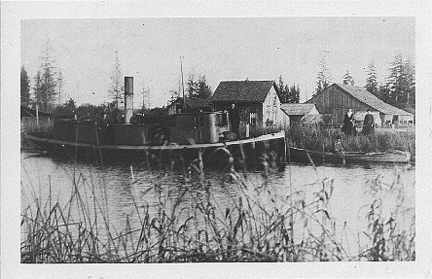 William Brown, a farmer from Hall's Prairie, kept a small sloop in the mouth of the Little Campbell in the 1880s and 1890s, and he would bring it upstream as far as the Semiahmoo Road bridge. Water transportation quickly declined after 1891 with completion of the New Westminster and Southern Railway. Additional rail links provided an improved export route for product of the forest and farm. Navigation on the Nicomekl ended with the construction and completion in 1912, of the flood control dams which replaced the bridges on the Semiahmoo Road. Freighting below the control gates slowly declined and ended in 1940. The Nicomekl River today is greatly alter compared to the river before 1912. The flood control gates, and the altered drainage patterns have caused silting as the large tidal flow and accompanying scour are no longer present. The Fraser River was a highly navigable river. Regular steamship service operated from Victoria to New Westminster, Fort Langley and Yale. Settlers timed their trips up and down the Fraser to coincide with the tides. This avoided a back breaking trip and made it a comfortable enjoyable one.